veryone knows Chucky, the infamous killer doll and horror movie icon, popular since 1988. How many people have heard of Robert – the real life demon doll on which Chucky was based? It was 1906. 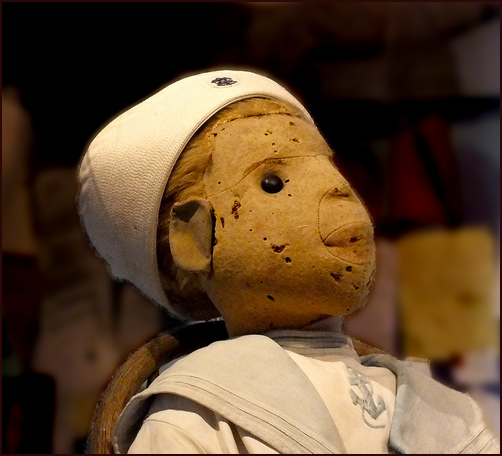 Robert the doll was a gift to young Eugene from a serving girl who had been mistreated by Gene’s parents. The girl was well versed in Voodoo and black magic, and imbued 3-foot Robert with powerful curses using appropriate offerings, prayers, and blessings. At 40 inches tall, Robert was about the same size as Gene; boy and doll would remain life-long friends. It was said that voices talking to each other could be heard in Gene’s room, when no one was there. There was a voice different from Gene’s, answering questions. When asked about bad things that had happened, Gene would say, “Robert did it”. The house they lived in got a reputation for being strange – people became wary about visiting. Devices like cameras would not work right, and bad things happened to those who took Robert’s photograph without permission. Neighbors claimed to see Robert moving from window to window when the family was out, along with hearing scary giggles. Gene died in 1974, but Robert lives on. A word of caution. I spent almost four hours trying to reach Robert’s online page, experimenting with various combinations of his address – even clicking on a direct link I found on Google, without success. I could reach the home page for the museum, but not the direct link to Robert. Finally, at 2:30 AM, out of shear frustration, I said out loud, “Robert, please let me visit!” Robert agreed. I tried the link and IT WORKED! Did Robert hear? Decide for yourself . . .